We have just come back from a busy time at the MotoExpo trade show at the NEC in Birmingham. We are more used to attending shows that have lots of bicycles on display so it was a nice change to see the huge range of motorbikes available to the trade. There was a section dedicated to historic two wheelers provided by the National Motorcycle Museum. It was interesting to see that the early examples were really based on bicycles with curved Dutch-style handlebars. 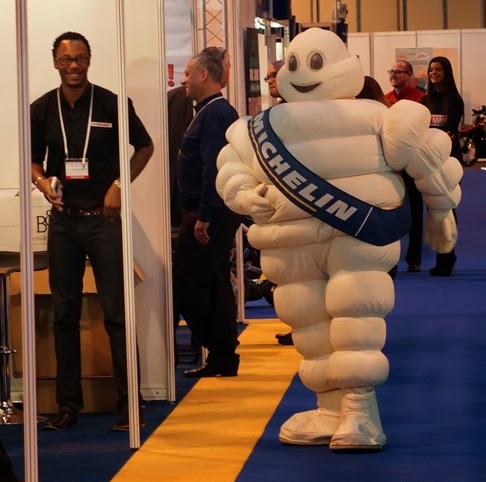 To add humour to the occasion a dancing Michelin man definitely put smiles on faces. Opposite our stand there was an electric drag bike designed to go very fast over a short distance. It had broken the British record for an electric bike at 97 mph. The drag bike’s batteries were exhausted in less than a mile. It’s battery technology is very different to that of Batribike electric bikes where the aim is to make the battery last over many miles with a maximum top speed of 15.5 mph. In addition to the electric bikes on display there were many conventional motorbikes. The Coca-Cola scooter took my eye as did this enduro bike. It was a very enjoyable three days and it was good to see and chat to some of our Batribike dealers - who also sell motorbikes. Electric bikes aren't just for the dry summer months, they are a bit like puppies, an electric bike is for life! With that in mind I have been thinking about the change in the weather. Whilst it isn’t as freezing cold as it could be, there is a serious amount of water out there at the moment. But the wet weather needn’t stop you riding your electric bike there are just a few things to bear in mind. The right clothing is important, make sure you have suitable waterproofs to keep out the worst of the wet. Gloves are important too, make sure your hands are warm and dry, this will keep your joints mobile and ensure that you can operate all the controls properly. Batribike electric bikes come with mudguards that will keep the worst of the road spray away from you the rider. Make sure they are correctly aligned to work at their optimum. Make sure that your tyres are in good condition so that they get the best grip on the road or track surface. Check that your brakes are working properly and that the water has not washed grit between the brake pads and the wheel rims. Remember that it takes longer to stop in the wet and that puddles can often hide a nasty pothole. It is best not to ride right against the kerb, ride slightly out so that you miss the painted lines which can become rather slippery in the wet. Remember that it is dangerous to ride any bicycle through floods. Visibility is key at this grey time of year, make sure that other road users can see you. Wear something bright and you might even need to have your lights on during daylight hours.